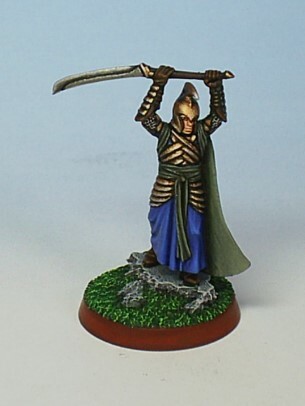 Following on from the article I wrote on painting a Gondorian warrior, here is my take on painting a Last Alliance Elf Warrior, the model used is a plastic one from the Warriors Of Middle Earth box. This article will go right through to the finished based model. Once again it is my hope that some of you will get some use from this. 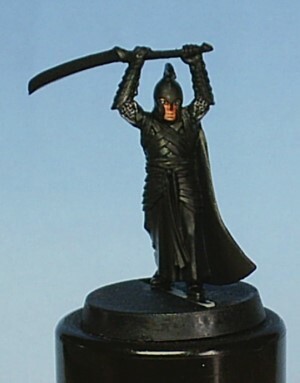 The model is painted to display standard and would not therefore be a useful way of painting models for use in an army unless you are totally mad or have more time than sense. Anyway here we go. 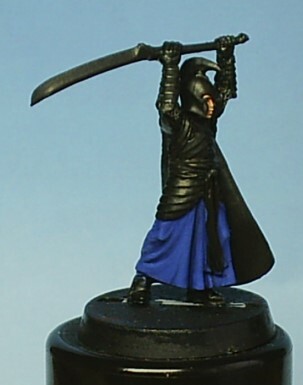 The first step is two clean and temporarily base the model in a slotta base, then undercoat it with Chaos Black, once dry then apply thin coats of Ghostley Grey to the face, don't worry about neatness at this time as this will be touched up later. 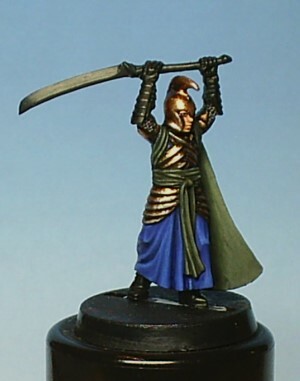 Also drybrush the areas that are meant to be chainmail first in Chainmail, then again lightly with Mithril Silver. 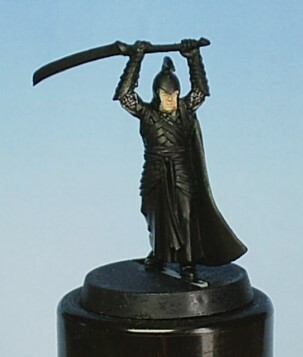 Then a coat of Elf Flesh is applied, remember keeping your paints thin (about the consistency of milk) will yield much smoother results. It may take a couple of coats of this colour to get a good solid covering. 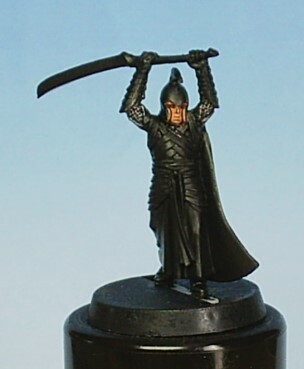 Next step is to shade the face, to do this we Dwarf Flesh with a little Tanned Flesh mixed in and thinned right down to about the consistency of Ink and then applied to the face. Once Dry you can add the eyes if you wish, I find it best to do this at this stage as any mistakes can easily be put right with the highlight stages. Now it is time to start the first highlights using a 50/50 mix of Dwarf Flesh/Elf Flesh and apply to the face, any mistakes around the eyes can be tidied up now as well. Then a final highlight of Elf flesh on the high points of the face are added. 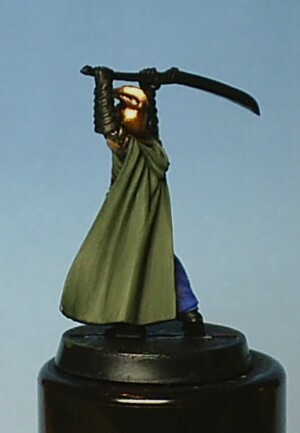 If you make any mistakes it is easy to shade down again and redo it. It took me a few goes to get it right. The next step is to start the skirt, this is given a basecoat of Ultramarine Blue, this will take two or three coats to get a good solid covering. 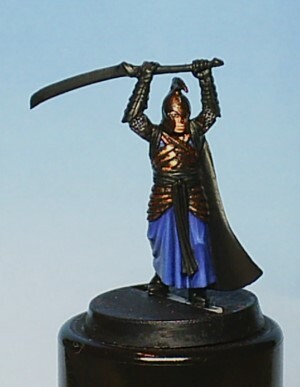 Now apply thinned down Regal Blue as a shading wash, be careful not to put too much on or it will pool and end up making the skirt look blotchy. 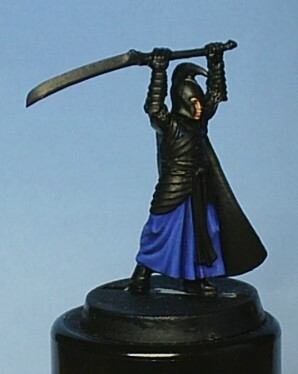 It is best to add shade washes more like a painted layer as it gives much more controlled shades. Finally in the deepest recesses paint in a thinned mix of Regal Blue and Midnight Blue this gives the impression of the deepest shadows. Now the shading is done we can start the highlights. 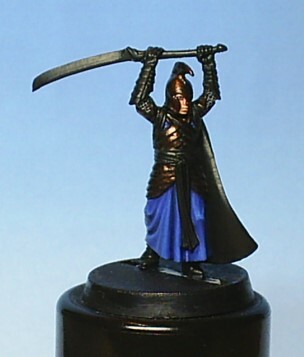 first we apply a coat of Regal blue/Ultramarine Blue about 50/50 mix to the skirt leaving the deepest areas in the shade colour. 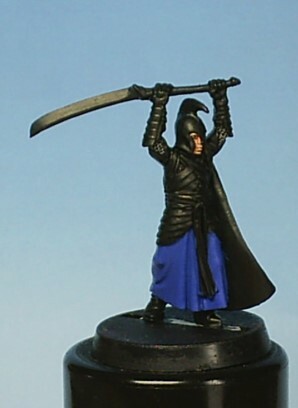 Then we apply pure Ultramarine Blue to the raised areas of the skirt being careful to leave some of the previous highlight visible. The next high light stage is done with Ultramarine Blue/ Lightning Blue but only mixing in a little Lightning Blue with each stage. The highlights should be added towards the highest parts of the folds in the skirt and as before we are leaving some of the previous highlight showing. The skirt now finished we turn to the armour of the chest, thighs and helmet. 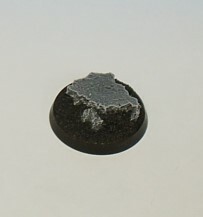 This is given a base coat of Tin Bitz, again keep the metal paint thinned down this is especially important when using metallic paint though you don't need to go as thin as you do with ordinary colours. Once this has dried the next stage is to add some Dwarf Bronze, I'm leaving the helmet at this stage as this will receive a slightly different set of stages to the rest of the armour. 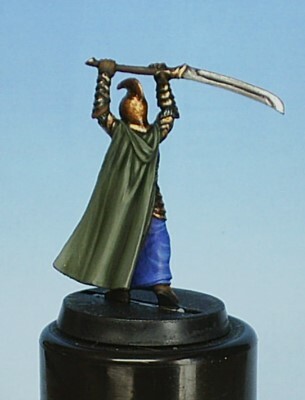 Next step is to apply Shining Gold to the armour again leaving a little of the previous stage showing. 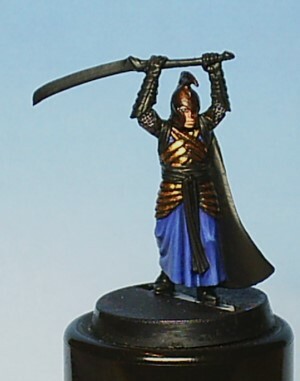 Note as well that I have left a definitive black line between the segments of the armour showing. Don't worry if you happen to go over as you can always reline it later. 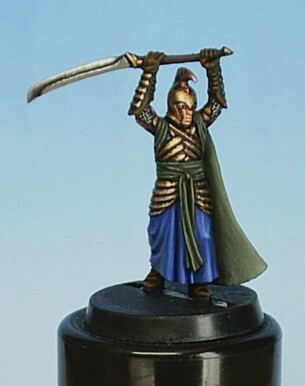 Shining Gold with a touch of Mithril silver is the next step, this gives a tarnished, worn look to the armour segments. Finally the armour is given touches of pure Mithril Silver on some of the very edges. 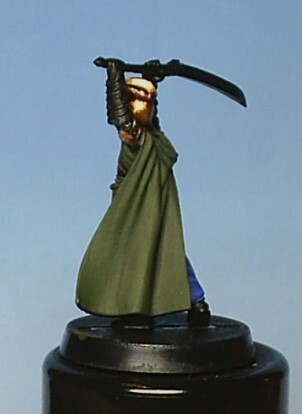 Moving right along we now start the cloak which is given a base coat of Catachan Green, then it has been shaded with Catachan Green mixed with Chaos Black. 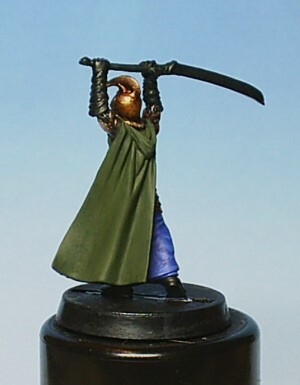 See also that the helmet has now been painted, this was done in the same way as the armour but there was an intermediate stage of Brazen Brass before applying the Dwarf Bronze. This was done to help coverage as it is a larger area. Now we go back over the cloak with Catachan Green leaving the shade in the deeper folds of the cloak, this same technique is applied to the sash around the waist and shoulders as this all forms part of the cloak. 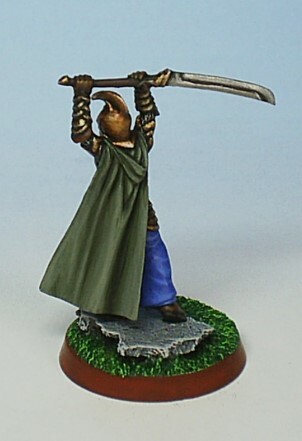 Highlighting is continued with Catachan Green, but now Fortress Grey is being added to it to give a more drab appearance, I've found this works better than adding White as that tends to make the highlights more grainy looking. A final highlight is applied to the highest parts of the folds with the Catachan Green/Fortress Grey mix adding a little more Fortress Grey this time. Now we can start to paint what is left of the armour which is done exactly as described before, the only difference is we miss the Dwarf Bronze stage out as areas this small really do not need so many stages. 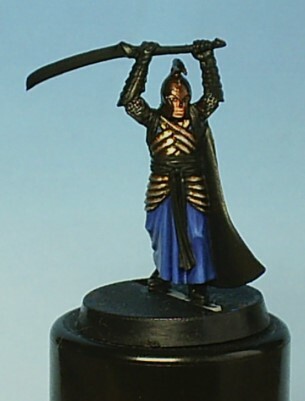 The gloves and boots are given a base coat of Scorched Brown, whilst the gold hilt of the sword is painted and the blade is given a basecoat of Boltgun Metal. The gold is painted as before. The gloves and boots are then shaded with a Scorched Brown/Chaos Black mix and then highlighted up with Scorched Brown, then Bestial Brown and finally a touch of Snakebite Leather on the high spots. The sword blade is highlighted with Chainmail and then Mithril Silver and a black line painted along the blade to give the impression of shadow along the casting. 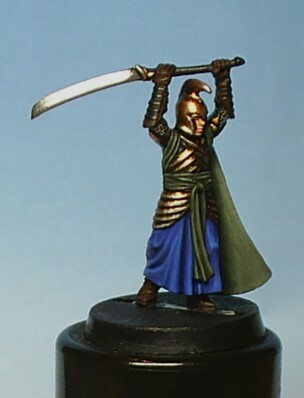 The gold plates on the gloves and the pommel of the sword are painted again being the same as before and finally the handle of the sword is painted Scorched Brown. Now the mini is complete and we can turn to the base. 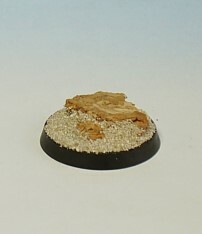 Firstly take your base and attatch torn up pieces of Cork tile to represent rock, when that is dry apply PVA to the rest of the base and add sand. 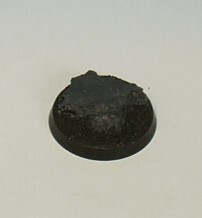 Let the PVA dry a little and then gently add watered down PVA to the sand and allow to dry completely. The watered down PVA will dry and seal the sand solidly onto the base. 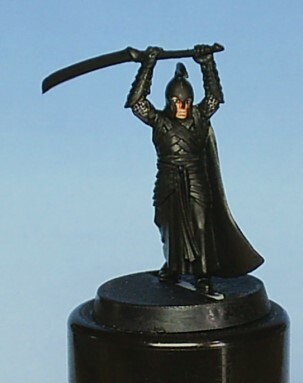 Next undercoat the base Chaos Black, allow to dry and then paint the cork Codex Grey and when dry apply a thinned down Codex Grey/Chaos Black mix as a shading wash.
Drybrush the cork first with Codex Grey and then with Fortress Grey and lastly with Skull White. Undercoat the sand with Dark Angels Green, and then dybrush with Snot Green, Scorpion Green and then very lightly with Bilious Green. 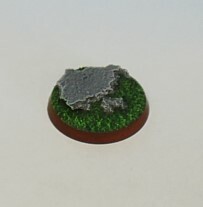 Finally add the miniature to the base and there you have it. One last alliance Elf. 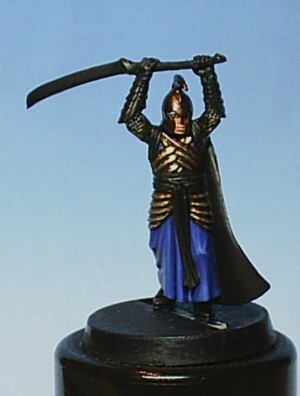 As previously mentioned not a way to paint for an army but if you want a display piece or a mini for a diorama then ideal. I very much hope you have enjoyed this article, please feel free to comment.